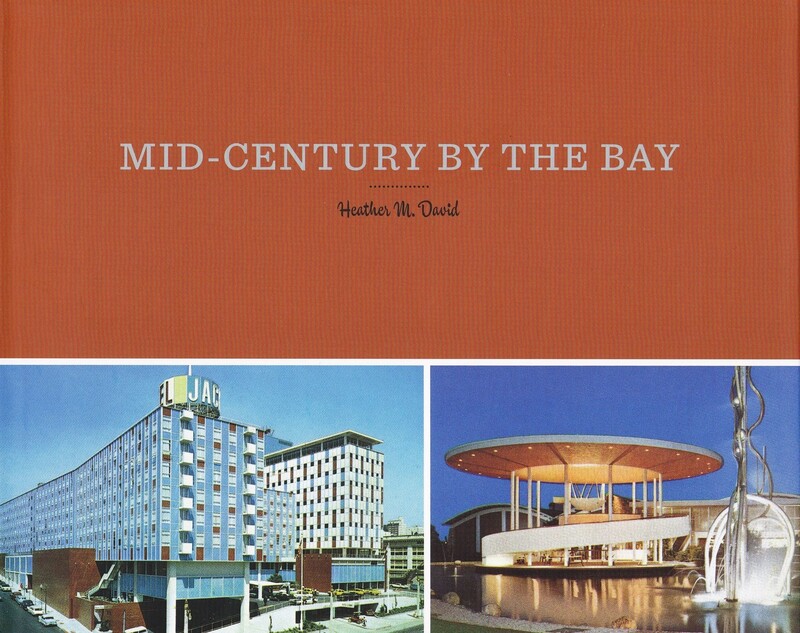 If you grew up in the San Francisco Bay Area, or are a fan of the design style and architecture of the mid-century, Heather David’s excellent book, Mid-Century by the Bay is a thoroughly enjoyable stroll down memory lane. David, a San Jose-based freelance writer and cultural historian, is also a Bay Area native, and her 152-page book features a combination of notable local architecture, culture and kitsch. It’s both an informative and nostalgic send-up of the 1950s to 1960s in the Bay Area. I first stumbled upon this engaging book in the San Francisco Public Library History Center when it debuted in 2010, but after my requested files arrived and I was quickly immersed in my research project of the moment, and forgot about the gem I found. Last month, I ran into the book again, at the Builders Booksource table at the California Preservation Foundation conference and was lucky enough to also meet the author. Mid-Century by the Bay is divided into eight main topics, after an introduction of the post-World War II building boom, population and industrial expansion that led to a suburban building frenzy in the Bay Area. The first main section, Bay Area Burbs, covers home design (with some photos of local homes built by Joseph Eichler of course), and the lesser-known Alec Branden, who built over 10,000 homes in Northern California, specializing in traditional and ranch style homes. Schools, churches and shopping centers are included, with old photos of the then newly built Valley Fair shopping center in Santa Clara and Stonestown in San Francisco, both built in the 1950s. A view of Valley Fair’s once-open courtyard, brick planter boxes and concrete cantilevered roofs creating shady breezeways for shoppers reminded me of my childhood shopping trips with my mom, a big fan of stores such as Joseph Magnin, I. Magnin and Somer & Kaufman. 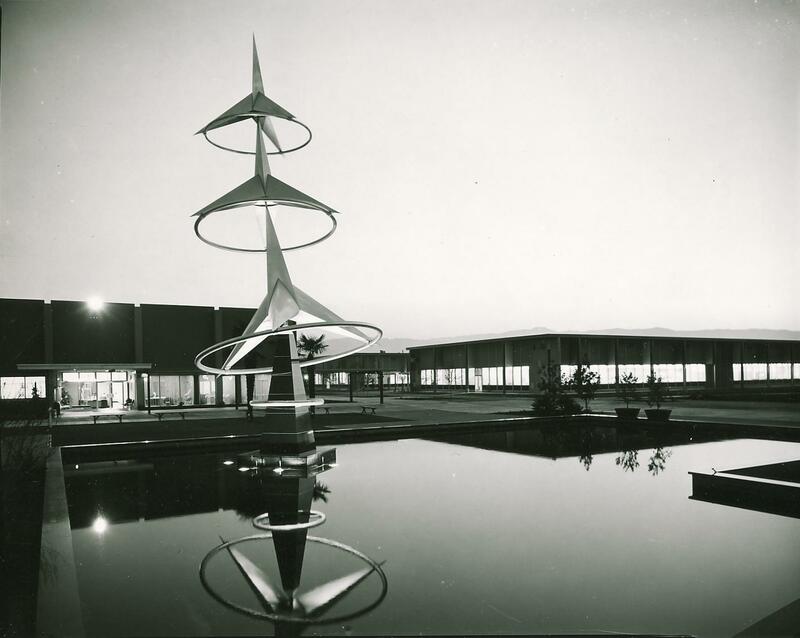 The “Architecture of the Future” section features some stunning mid-century design in the Bay Area, much of which has been destroyed, or modified as unrecognizable today. As David writes in her epilogue, the Bay Area has suffered from both demolition and “the ’blandification’ of many of its mid-century structures.” The buildings at IBM Corp.’s Cottle Road campus, designed by architect John Savage Bolles, were accented with brick and multi-colored tiles, the tile pattern mimicking an IBM punch card. Some art that graced the campus is now gone or in disarray, such as the stunning Hyrdo-Gyro sculpture by local artist Robert Boardman Howard, which is now in pieces on the ground. Howard, the son of architect John Galen Howard, also worked with Tim Pflueger on the Paramount Theatre and the San Francisco Stock Exchange. Another one of my favorite sections is the one called “Bay Area Road Trip,” with photos of some of my long-lost childhood haunts, such as Santa’s Village in Scotts Valley and the Nut Tree in Vacaville. David’s superb collection of ephemera and photos includes a 1960s interior view of the fabulous Nut Tree restaurant (alas the bird aviary isn’t in the scene) and workers in the company kitchen, making sugar sticks and suckers by hand. David’s book, like Pierluigi Serraino’s superb NorCalMod, showcases both the simple beauty and the eccentricities of the mid-century and the Bay Area’s rich development during the era. It also calls out the need for more preservation of our most recent past, before we lose even more of it. 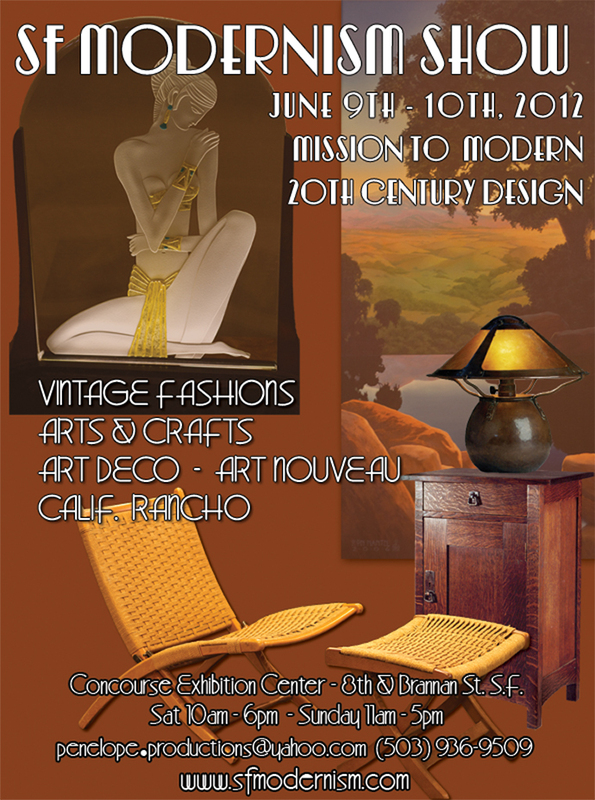 David will be signing and selling her book today, June 9, at the San Francisco Modernism show at the Concourse Exhibition Center at 8th and Brannan streets, along with yours truly selling and signing Art Deco San Francisco at a discounted price. If you haven’t yet got a copy of Mid-Century by the Bay, it’s a great deal at $40 and a lovely Father’s Day gift. Come on down.